Molecule encapsulation in virus-based nanoparticles (VNPs) is an emerging bioinspired way to design novel functional nanostructures and devices. 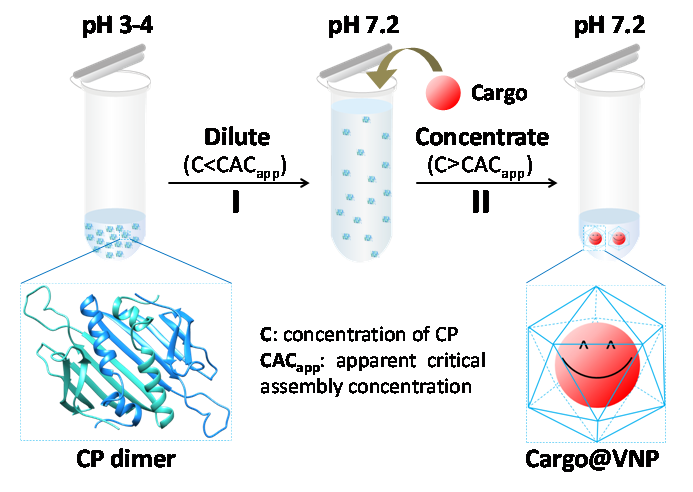 In a joint study, the research groups led by Prof. LI Feng from Wuhan Institute of Virology of the Chinese Academy of Sciences and Prof. ZHANG Xian’en from Institute of Biophysics of the Chinese Academy of Sciences reported a general cargo-compatible approach to encapsulate guest materials based on the apparent critical assembly concentration (CACapp) of VNPs. Different from the conventional buffer-exchange method, the new method drives the reassembly of VNPs to encapsulate cargoes by simply concentrating an adequately diluted mixture of VNP building blocks and cargoes to a concentration above the CACapp. This method has been proved to work well on different types of cargoes (including inorganic nanoparticles and proteins) and VNPs. The major advantage of this method is that it can maximally preserve cargo stability and activity by providing the freedom to choose cargo-friendly buffer conditions throughout the encapsulation process. This method would benefit the realization of the potentials of VNPs and other protein nanocages as nanomaterials in diverse fields of nanotechnology. The results have been published in Nano Letters entitled "Cargo-Compatible Encapsulation in Virus-Based Nanoparticles". This work was supported by grants from the National Natural Science Foundation of China, Science and Technology Program of Guangzhou, China and etc.